After product/market fit, driving sustainable growth is probably the most important/difficult part of creating value in a startup. For most of the last 15 years of my startup experience, I’ve been the point person responsible for primarily one thing: driving growth. Even after two IPOs, I didn’t really have a firm grasp of the essential elements of driving growth. My view has evolved from externally focused metrics-driven marketing, to a more holistic approach built on a solid foundation of product/market fit. Even the greatest marketers can’t sustain growth on a weak foundation. Eventually, their growth curves crater. So what is required for a strong foundation? The first is that your churn will be relatively low (if it’s a “must have” why would users leave? ), so you won’t be wasting resources filling a leaky bucket. The second is that “must have” products generally maintain strong word of mouth. Together, these two elements give you a steady upward trajectory of your growth curve until you reach market saturation (hopefully you are in a big market!). An important caveat is that your product will stop being a “must have” if a competitor offering a viable substitute enters your space. If they are really a good alternative to your product, then you’ve been downgraded to a “nice to have” and your foundation starts getting shaky. Therefore, once you become a “must have” it is critical to get to the growth phase of your business as quickly as possible. Your ability to accelerate growth will be greatly enhanced if you optimize conversions. There are many ways to define a “conversion” but for me, it’s a person who reaches the “must have” experience. If 1000 new visitors come to your website and only 50 experience the “must have” benefit, it’s very difficult to efficiently grow your business. However, with focused attention on fine-tuning the first user experience, startups often see a 2x – 10x improvement in conversions. This immediately enhances your growth curve since word-of-mouth referrals begin “sticking.” It also greatly enhances your ability to find viable, scalable ways to grow your user base (especially when combined with a good monetization approach). Most startups entering the growth stage obsess too much on finding a VP marketing capable of building and managing a large marketing organization. At this stage your more immediate challenge is finding sustainable, scalable growth drivers to augment the organic growth achieved through solid product/market fit and conversion optimization. If you are compelled to bring in a VP Marketing at this stage, make sure he/she has a track record of developing scalable growth drivers and is willing to make this their core focus until it is figured out. Otherwise, I recommend instead bringing in a scrappy growth hacker to generate a strong flow of ideas for experiments that will scale if successful. The faster you run high quality experiments, the more likely you’ll find scalable, effective growth tactics. Determining the success of a customer acquisition idea is dependent on an effective tracking and reporting system, so don’t start testing until your tracking/reporting system has been implemented. Once scalable growth tactics are developed, then a VP Marketing may be important for building and managing the marketing team that will execute these tactics. One benefit that is emerging from advising multiple startups is that our rate of collective discoveries is accelerating across the non-competitive network of startups. With sharp, creative growth hackers in each startup we are able to brainstorm and test many more tactics. The best ones are exchanged across the network for everyone’s benefit. As the preceding paragraphs hopefully demonstrate, growth is a function of multiple factors. 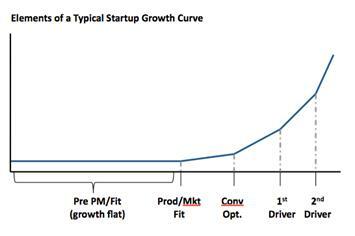 Focusing on the right factors at any given time offers the best chance of ultimately becoming a high growth startup. One exception to this rule are startups like eBay, Facebook, and Twitter, where “must have” status could only be achieved after critical mass. In these startups, they did not have the luxury to focus on one element at a time – instead they had to work on the full growth ecosystem at one time. But for most startups, you will approach your full growth potential by obsessively focusing on the most important goal for your particular stage. This entry was posted in Acquiring Customers, Analytics, Optimization by Sean Ellis. Bookmark the permalink. CEO of GrowthHackers.com. Previous roles include first marketer at Dropbox, Lookout, Xobni, LogMeIn (IPO), and Uproar (IPO). Also interim marketing exec roles at Eventbrite, Socialcast, and Webs. Was this the same case with 20×200, which is a marketplace for affordable quality art? It seems like this needs to be both a “must have” product for the artists and the buyers, right? Do you find it harder to work in this type of space since you’re satisfying 2 large parties rather than just 1? Hi Joseph, unfortunately my NDA prevents me from going into the specifics of most companies. But I did touch on marketplaces at the end of my post where I wrote critical mass is required for certain products to become a “must have.” I’m not sure that I’d classify 20×200 as a marketplace though. When looked at from the perspective of the technology adoption lifecycle and financial market behavior, growth can be driven for a time, then it’s over. Continuous growth is myth. When growth stops, disruptive innovation, either technical or business, is required. Maybe it makes sense to generalize that last paragraph. Your examples of corporations (eBay, Facebook, and Twitter), all have one very important thing in common: network effect. In the “network effect” startup space, it seems even more critical to rapidly test and iterate in parallel. Submit your email below to get the latest updates from Startup Marketing!